Daniel MARGUERAT – Adrian H. W. CURTIS (éd. 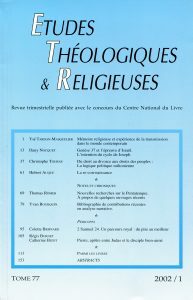 ), Intertextualités, la Bible en échos, (Le monde de la Bible 40), Genève, Labor et Fides, 2000. 22 cm. 332 p. ISBN 2-8309-0946-6. FF 180. Joël MARCUS, Mark 1-8, (Anchor Bible 27), New York : Doubleday, 2000. 24 cm. xix-569 p. ISBN 0-385-42349-7. $ 42,50. Greg W. FORBES, The God of Old. The Role of the Lukan Parables in the Purpose of Luke’s Gospel, (JSNTS 198), Sheffield : Academic Press, 2000. 24 cm. 388 p. ISBN 1-84127-131-4. £ 56/$ 88. Stanley E. PORTER – D. A. CARSON (dir. ), Linguistics and the New Testament. Critical Junctures, (JSNTS 168), Sheffield : Academic Press, 1999. 24 cm. 297 p. ISBN 1-85075-991-X. £ 46. Martin ASIEDU-PEPRAH, Johannine Sabbath Conflicts as juridical Controversy, (WUNT II/132), Tübingen : Mohr Siebeck, 2001. 23 cm. xiv-280 p. ISBN 3-16-147530-5. DM 98. Pierre PRIGENT, L’Apocalypse de saint Jean, (Commentaire du NT XIV), Genève : Labor et Fides, 2000. 23 cm. 507 p. ISBN 2-8309-0114-2. FF 298.